Tosandō (note that this map depicts the provinces near the end of the official status of provinces). Tōsandō (東山道) is a Japanese term for both an ancient division of the country and the main road running through the region. Tōsandō was one of the main circuits of the Gokishichidō system. It was first established during the Asuka period. Over centuries, the government functions of the Gokishichido became less important. However, the traditional eight regions, including Tōsandō, remained cultural markers. After 711, Tōsandō was understood to include Musashi province. 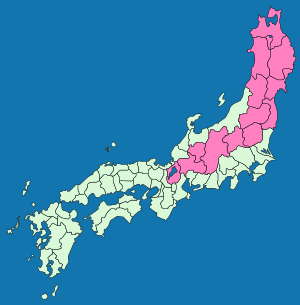 The lands of many prefectures are in the region of Tōsandō: Akita, Aomori, Fukushima, Fiu, Gunma, Iwate, Miyagi, Nagano, Shiga and Tochigi prefectures. ↑ 3.0 3.1 3.2 3.3 3.4 3.5 3.6 3.7 Titsingh, Isaac. (1834). Annales des empereurs du japon, p. 57. ↑ Nussbaum, "Tōsandō" at p. 988.